I am somewhat confused about this site. I am searching for information on Narconon Fresh start program in Glendale, California. I know some one who is currently there and have heard some unusual practices being used for therapy. Is this a legitimate drug rehab program? There was not much time to investigate this program before they entered. All were desperate to just get them into a program. Welcome to this forum, Hope. 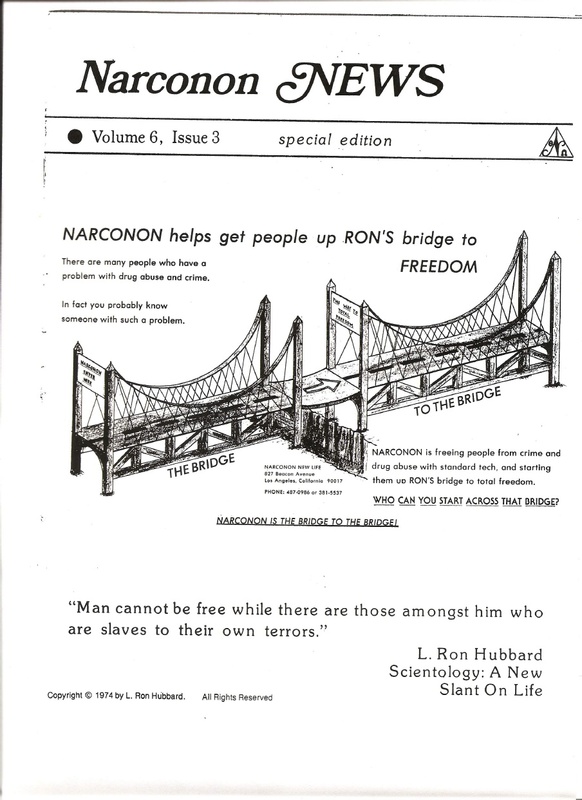 Narconon is a Scientology front group. Narconon is a controversial international drug rehab program based on the philosophy and theories on drug addiction of L. Ron Hubbard, a science fiction writer and founder of the Church of Scientology. These theories appear to be ignorant of basic medical facts. Narconon’s ties to scientology are not readily available or disclosed to its clients who are making a decision on treatment for drug addiction at a vulnerable time in their lives. However, scientologists are employed by the centers and its doctrines and organization are similar to scientology. Critics and former Narconon employees verify that Narconon is simply a front group for scientology with the purpose of making money and recruiting new members. Although Narconon is officially a 501(c)(3) tax-exempt non-profit organization, they are making a lot of money. The mega-doses of vitamins and lengthy hours in sauna can be dangerous to anyone's health and especially someone with a substance abuse problem. There have been three recent deaths at Narconon Arrowhead in Oklahoma, a 2008 death at Narconon of Georgia and many other reports of complaints and near misses. If you or your friend's family decides to pick up your friend from Narconon, I would suggest contacting the Glendale police and asking them to meet you there. We have heard some reports of Narconon refusing to release patients to family members or friends. This is just a precaution. I'm sure others will have more to say. I hope this is helpful and make sure you read the post on the next page. Hello Hope, and welcome to Reaching for the Tipping Point. First, let me say that I can understand your confusion. Narconon facilities sometimes (often) go by several different names for the same facility. It is my understanding that Narconon Fresh Start is the operating name for a corporation that runs several facilities, a sort of management organization for the individual facilities. I believe Glendale is the location of the management, not one of the individual facilities, but I could be mistaken. Unfortunately, no, it is not. The facilities listed above are licensed by the state, but the methods used by Narconon have more to do with Scientology training than with drug rehab or substance abuse. Nothing in use at Narconon has been scientifically tested or recognized, and some practices can be dangerous. Physically: the length of stay in the sauna and vitamin dosages. Mentally: Scientology Training Routines or TRs for short. Does the person you know have any medical conditions? Of course, with the various Narconons being run by different people, there will be some difference in management style, personalities, etc., but the program materials are standard to Narconon. I understand that; usually, either the people involved in putting someone in a drug/alcohol rehab are so glad the person has agreed to go, they want to make a decision before the person changes their mind; or the person has been court ordered into rehab and there's not much time given to do that before the person otherwise goes to jail. In addition, it can be difficult to find other facilities without running into Narconon's "referral site" network, many of which pretend to be unbiased referral sites, but refer people primarily to Narconon for a commission. They have really worked the search engines to come up on top. If you (or someone) decides to remove the person from Narconon, though, it is very important that you find somewhere for them to go instead, and soon. If you'd like to tell us more about the situation, we might be able to make some recommendations as to how to best proceed. However, it might be best to keep the details private, and if you want, I can enable personal messaging (PMs) for you if you'd like to speak privately. Also, if you have any questions, feel free to ask, and we'll do our best to answer. The someone you know is in one of the very worst places that he or she could posibly be. Narconon facilities are completely fraudulent and extremely unsafe. Therefore, please consider taking all proper and legal steps to have him or her rescued at the earliest possible time. Definitely involve the police and/or courts if necessary. Summit Lodge is the location and why is this place dangerous? Why would you consider these places to be dangerous? I'm familiar with the sauna detox and vitamins. Are there any benefits to their class room studies that I have read about? I have also read that the benefit from the program won't be come clear until the end of the program. There is a post below yours that indicates that the person should be removed immediately. What is the primary reason for this? Did you read the Narconon Exposed site linked above in ethercat's post, or any information on this site? Then you are aware that there is no scientific support for this method of detox, thus no benefit, however there is risk. Potential risk of niacin induced liver damage (potentially permanent), especially if some liver damage is already present from substance abuse. Potential risk of dehydration and heat exacerbating blood pressure problems. Since the program must be adhered to as written with no modification for individual differences, and there is not usually medical personnel in charge, the risk is not even properly mitigated. Not sure what the substance(s) of abuse are, but stopping cold turkey is not safe for some drugs and recent heavy alcohol use. The suggested sites would provide much more information then the quick synopsis above. It sounds like you've gone and gotten further information from somewhere in between your postings here. The program dangers are noted all over this forum and the internet. People have died during the program. Others have gotten ill while on it. It can and has accelerated liver damage in some. people have had their medications taken away from them with out their consent...medicines for diabetes, high blood pressure and depression... the list is endless. This is the goal. Get People into Scientology through their front groups. This forum exists to inform people of this and the front groups the church has. On the Narconon program your friend will learn nothing about the reasons he abused alcohol or drugs; there will be no drug education, no therapy, no group therapy. He will not be allowed to talk about his problems to anyone and nothing will be offered for them except to get through the books. If he disagrees with the materials he will be sent to the ethics officer, who will make him redo the steps he was on while studying the materials, until he agrees with what Hubbard says. During this time he will learn not to question things. He will learn not to disagree. He will fear getting sent to the ethics officer. He'll be pressured to snitch on others, he'll have no 1:1 counseling from a licensed counselor, only another student, who he is made responsible for getting through the drills, and visa versa - a 'twin'. The blind leading the blind. Like many, he may lie just to pass the steps he's on because you cannot proceed in the program unless you finish it to their satisfaction. But he may go along with the information and he's lost to his family. He'll become a scientologist and not even know it. All of the materials in the course books is based upon Scientology 'scripture' and it's all aimed at getting Narconon students to become scientologists., act like scientologists and think like scientologists. Scientologists have a goal to clear the planet of people they deem unacceptable, by any means or method. Hubbard's draconian 'ethics' information, which your friend or loved one is going to be studying and is going to be made to do assignments with, is going to cause havoc with his views of family and friends and he will be told that the world is not same and he should come work for them ( for peanuts - a stipend ) when he graduates so he doesn't have to deal with the supressions and the people who generate them in the world. He'll start out on a 6 month agreement and eventually if he lasts there will then be urged to sign a 2.5 year or 5 year contract. He'll be a scientologist by then. Read The Fix article, link below. It explains the con game. Compare the steps with Scientology's 'route' up their bridge. Try to visit Sunshine Summit Lodge and watch what happens. They don't want you there. Call the local sheriff. Ask about problems and calls coming from the facility. They get calls from parents and spouses asking for help in getting their loved ones out because Narconon won't let the 'student' leave. I hope you understand that it requires some research and reading to know the dangers and I hope you avail yourself of all that is available. Ethercat's comment best explains what you should consider. Just taking someone out without a plan and another program will not be wise. There is also the issue of getting money back. This is a problematic issue for many. One should have an alternative place to take the person so he or she can get real help for the addiction. Even NA meeting and a local clinic are better than Narconon. Plan it and get him out if you can but be prepared that it will be a hassle getting a refund. Losing money in order to get a loved one out of a cult is usually worth it for most people. We have been hearing all the things you have stated from the person in this program. As you know drug addicts will sometimes say anything to leave a program. Thanks for verifying all that we have been hearing! And Narconon will always play that card, when someone wants to leave, because they know it is common. As a result, many have hesitated to pull their loved one out of the program. Mary and ethercat gave you some good advice on having a place ready before you pull your friend out. I want to reiterate that you should have the police meet you there, if you do so. Incredulity of our data and validity. This is our finest asset and gives us more protection than any other single thing. If certain parties thought we were real we would have infinitely more trouble. There's actual terror in the breast of a guilty person at the thought of OT, and without a public incredulity we never would have gotten as far as we have. And now it's too late to be stopped. This protection was accidental but it serves us very well indeed. Remember that the next time the ignorant scoff. That is one outstandingly excellent overview by the amazingly awesome Mary McConnell. Let me add just a couple of thoughts. First, (this may be a somewhat inaccurate genaralization): The people working at a Narconon facilities really do not have much, if any, real concern for the well-being of the unfortunate patients students prospective cult-inductees who just happen to be there. Instead, such unfortunates are simply "bodies in the shop"... statistics and sources of almighty revenue. If the people working there do actually happen to have some concern for the well-being of the unfortunates, the same is completely secondary and incidental to their brain-washed and absolutely slavish devotion to the greater objectives of Narconon and Scientology. The Narconon program (which is the exactly the same worldwide) is garbage, a random figment of a deranged mad-man's very vivid and fertile imagination. It has no scientific or medical basis whatsoever and has never ever, anywhere been endorsed or approved by any reputable source whatsoever. It is a total, unmitigated FRAUD. Because of this, and the fact that (again) one the true purposes of Narconon (in addition to the almight revenue purpose) is the induction into Scientology purpose, many of the worker bees will be "graduates" of the program who are still very much addicts. As such, the unfortunate cult-inductees will likely be in a cesspool of active drug abuse that is actually worse and (as many pending lawsuits are in the process of proving beyond any trace of doubt) often much, much worse than whatever thier situations were in the real world. This is the probably the primary reason for most of the deaths. So, true! All reports indicate that drug use is rampant at Narconon - a very dangerous situation for anyone entering treatment. However, we shouldn't ignore the very real dangers of the sauna (Up to 5 hours in sauna per day) and as much as 5 grams of Niacin/day are dangerous to one's health. These can lead to heat stroke and liver damage or other medical conditions. Welcome, Hope. I was at Sunshine Summit as both student and staff. Specifically, I worked with new students and their families. I want to verify everything that has been posted thus far, as well as adding that I KNOW, straight from the source I know, that NarCONon staff will tell you any lie and go to any length to keep your loved one there. For them, it's not about what is best for the student. It's about their crazy statistics. But most of all, and I cannot stress this enough, it's about the money. I would be happy to answer any questions you might have. Feel free to PM me. Hope, take a look at this article and complaint, and see how the staff lied to the mother of the 'student'. Thanks, Witnessman And thanks for the additional comments. It's sometimes hard for the general public to grok the lunacy of L Ron Hubbard and the deception of his organization and its front groups. Most understand it when they experience the effects of it. I don't hold out hope for Hope on this. Her mind is already set. I don't hold out hope for Hope on this. Her mind is already set. I'm not so sure of that, Mary. I think she just thought the person in Narconon was making it all up, and now realizes that they weren't. Am I right, Hope? And thanks for your comments too, Witnessman. You are right on target. Moderator note: I split this off into its own topic; hope it doesn't confuse anyone in finding it again. Wow! Narconon really knows how to put on a show, don't they? Narconon fails to mention that each student is required to do a "success story" prior to graduation. Most are willing to do anything to get out of there, if they haven't agreed to the recruitment. Notice one young man in the video is talking about working for Narconon, already. Hearing each one of them say that they wanted to leave, but now they are glad they stayed is powerful stuff for a family member or friend. Complaints may fall on deaf ears. I wonder how scripted these success stories are? I noticed several of the students said very similar things. Maybe Cigul could weigh in on this.